CrossFit Football is a strength and conditioning program designed by NFL players and coaches for football players and other power athletes. The program uses a variety of functional movements executed at high intensity levels to simulate the metabolic demands of a football game. These movements include weightlifting exercises to increase strength and power along with running to improve agility, footwork and overall conditioning. A common exercise for conditioning is the "gasser" with several variations based on the overall goal of the day's workout. The gasser is a specific conditioning drill used by CrossFit Football in conjunction with the workout of the day (WOD) -- and is effective for football players of any ability level, ranging from professional and collegiate athletes to youth or beginning players. The overall function of the gasser drill is to build a strong mind, heart and body along with developing speed, agility and power. Your goal in every gasser is to perform the drill as fast as possible, thus creating the most speed and power. You complete a full gasser by running the width of a football field four consecutive times. Start on one sideline and sprint to the opposite sideline, touch the sideline and immediately sprint back to the starting line. Touch the starting line and repeat by running down and back. 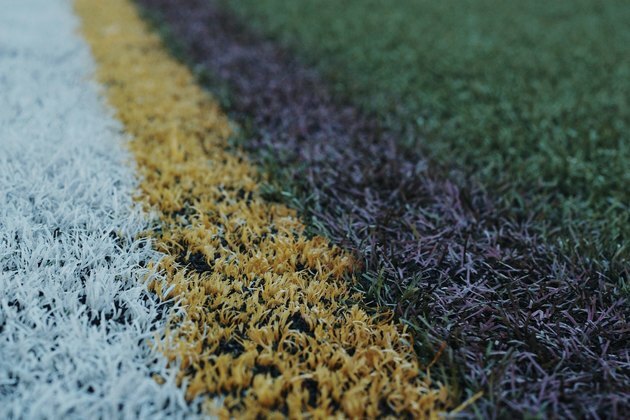 The football field is 53 yards wide, so one full gasser covers 212 yards. The goal is to maintain a high speed for the entire drill. A 1/2-gasser is exactly half of a full gasser. Start on one sideline and sprint to the opposite sideline, touch the line and sprint back to the starting line. The 1/2-gasser covers 106 yards to be covered as fast as possible. Some CrossFit Football workouts incorporate the 1/2-gasser into a circuit where you complete other exercises such as cleans, squats or deadlifts. The 1/4-gasser covers one width of the football field, an opportunity to work on all-out speed and running form. Start on a sideline, accelerate and run as fast as possible to the opposite sideline. Similar to 1/2-gassers, the 1/4-gasser mixes into various CrossFit Football workouts. Some workouts include running 1/4-gassers on the minute for 10 to 15 minutes.